Beautiful very nice clean approx. 1,144 sq. 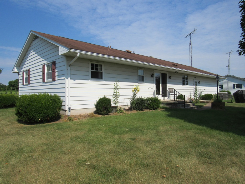 ft. 3 bedroom, 1 bath rancher home w/ 2 car attached garage w/ blacktop driveway on approx. .57 acre lot. Property has private well & septic, barn style storage shed in rear. Home has newer replacement windows, Lenox central air conditioning, electric heat, electric hot water heater, circuit breaker electric. Home has front porch entry, man door at garage w/ garage having 2 car overhead garage door w/ opener, 2 rear cemented patio areas. Home has finished 3 room basement including 2 room family room w/ white brick bar area, washer & dryer area w/ basin sink & storage room. 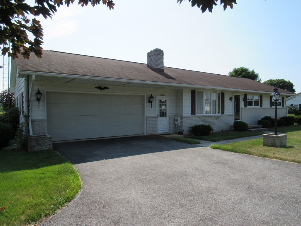 Main level of home includes living room w/ front entry-white brick fireplace & bay window, kitchen w/ breakfast bar-dining area w/ sliding doors to rear porch, hallway w/ linen closet, full bath with tub/shower, 3 bedrooms w/ closets. 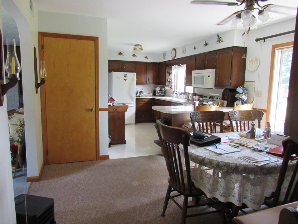 Appliances included washer & dryer, electric stove, hanging microwave & Kenmore refrigerator. Yearly taxes approx. $1,899.53. A very nice clean smoke & pet free must see home. Real Estate Terms: $10,000 Down Day of Sale in Cashiers Check, Settlement within 60 Days. Legal Description & Terms: The property sold consists of all that parcel of land designated as Lot 1 on a plat of Section One, Suburban Developers, Inc., known as “Fringer Road Development” which plat is recorded among the Land Records of Carroll County in Plat Book 6 page 46. The lot was described in 1970 as “fronting 125 feet along the east side of Fringer Road and running a uniform depth of 200 feet”. It is now assessed for 24,829 square feet of land, more or less, in real estate Tax Account No. 01-009826. It was conveyed to Earl R. Welty and Ethel H. Welty, by deed of Suburban Developers, Inc dated October 7, 1970 and recorded among the Land Records of Carroll County in Liber 476, folio 226. 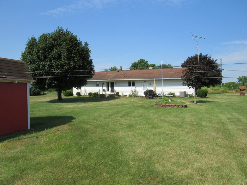 The property is improved by the dwelling located on it with a well and septic system. The property is generally depicted on Carroll County Tax Map 19, as Parcel 266. The terms of sale are that Purchaser shall submit a deposit of $10,000.00 in cash or certified funds at the time of sale and shall settle on the purchase within sixty (60) days from the date of sale. All settlement, transfer and recording costs shall be paid by the Purchaser. Upon default by the Purchaser, the deposit shall be forfeited and the property may be resold at Purchaser’s risk and expense. The defaulting Purchaser shall not be entitled to receive any benefit or proceeds from the resale. Seller agrees to convey the property free and clear of liens. The property and all improvements are sold AS-IS/WHERE-IS. Seller makes no representations or warranties regarding the condition of the property or any of the buildings, improvements, fixtures, systems or services. Time is of the essence.